In the early 1960’s, the Detective Bureau and Administration staff of police departments throughout the country saw an increase in homicides, robberies and narcotics. In 1963, here in Manhattan Beach, crime was escalating, and the police department was faced with its first bank robbery. Narcotics and hallucinatory pills had become alarmingly prevalent and law enforcement was doing all it could to make the community aware of the dangers of drug use. Drug raids were carried out by the Manhattan Beach Police Department, resulting in hundreds of both local and outsider arrests. One such raid where thousands of dollars worth of drugs were seized, involved the El Segundo Police Department, along with the Federal Narcotics Bureau. However, it would be the case of George Jung that brought the community into the national limelight. During the summer of 1967, 25-year-old George Jung arrived in Manhattan Beach. On the surface, this seaside city might have appeared to many as a quiet, low profile community, for officers however, it was labeled as the reigning party town of California’s southern coast. It was a little wonder that this drug taking young man thought he had found paradise. George wanted wealth, and in the temper of the times, what better way than to get into the distribution of drugs. To George, Manhattan Beach was the place: close to the Los Angeles International Airport and close to the Mexican border. The Manhattan Beach Police Department had only one narcotics officer, 31 year old Fred McKewen, who had no budget for launching undercover operations. Being easily recognized by all the drug dealers in town made his job doubly difficult. While McKewen and the department did work with US Customs, as well as federal and state agencies, he was never able to arrest Jung. It was said, George made approximately $100 Million Dollars while working with a cocaine cartel before losing it all. He was finally caught and sent to prison after a lifetime of using and selling narcotics. Years later, Bruce Porter, former writer and editor for “Newsweek” wrote the book “Blow,” The Jung story. The book was also adopted into a movie, part of which was filmed here in Manhattan Beach. The drug scene remained to be very evident throughout the decade as indicated in January of '68, when four people were arrested for distribution of $7,000 worth of drugs and nearly a pound of opium. In '69, six people were arrested, breaking up a drug, counterfeit money and burglary ring. In that same month, $10,000 worth of narcotics, ten kilos of marijuana and hashish was recovered, resulting in the arrest of three Manhattan Beach residents. Other crimes were also engaging the department, it could have been out of an old western novel. In March of 1968, the corner of 8th Street and Sepulveda Blvd. became the site of a shootout at the old El Rancho Motel. Thirty five year old Arthur Glen Jones had barricaded himself in a motel room, after being approached by Manhattan Beach Police Offiers. Jones threatened to shoot the officers and blow the motel room up if they did not leave. He told the police he would not be taken alive and refused to come out. Jones set off several sticks of dynamite in the room, after detective Don Stone, who was first on the scene, fired tear gas into the room. Jones drove through the window while firing his gun at officers. A hail of police bullets followed, which caused the death of the fugitive. It was reported that Jones had escaped from San Quentin prison where he had been serving a life sentence for the 1959 killing of a Redlands tavern owner in San Bernardino. By 1969, Chief Withers decided to retire; it had been a long and arduous decade. 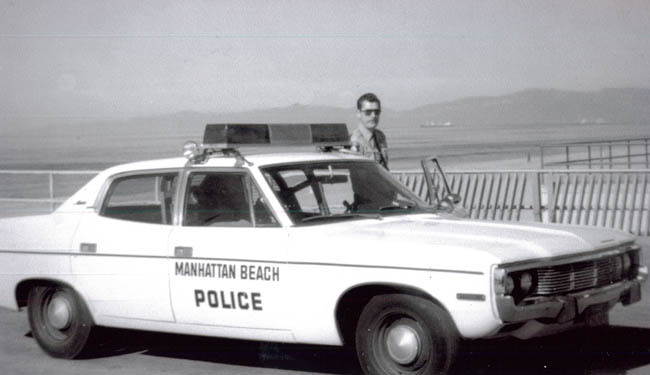 On September 3, 1969, Charles W. Crumly became the seventh Police Chief of Manhattan Beach.